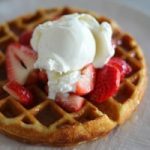 The story of Buttermilk Waffles with Berries, Ice Cream and Buttermilk Syrup long time ago, my daughter Brookie played volleyball. It was a tradition with her jr high team to eat waffles and ice cream for team breakfasts. Those early morning team gatherings in our kitchen were a whirlwind of giggling, sugar, and the scent of waffles cooking before the girls ran out the door to make it to class. If you love waffles and whipped cream, you’re going to love waffles and ice cream. One bowl, one waffle iron. Waffles: Preheat a waffle iron. In a large bowl, stir together the dry ingredients. Make a well in the center and add the buttermilk, milk, eggs, and melted butter. Mix together just until combined with fork or large spoon (don't over mix the batter). The batter should look slightly lumpy. Spray the waffle iron with the nonstick vegetable spray. Pour 3/4 cup of the batter or the amount recommended by the waffle-iron maker onto the waffle iron; bake as directed by the manufacturer. Top waffles with fresh berries, buttermilk syrup and ice cream. Syrup: Heat butter, buttermilk, and sugar in a saucepan. Heat until boiling, stirring often. Boil for about 1 minute. Remove from heat and add vanilla and baking soda. Stir until combined. Serve immediately. Refrigerate any leftovers. -I usually double the waffle batter and the buttermilk syrup for a family of 6. Yumm….I do a version of this cream syrup but we've never had it with ice cream. It looks like dessert and breakfast rolled into one. Can you use AP flour instead of cake? 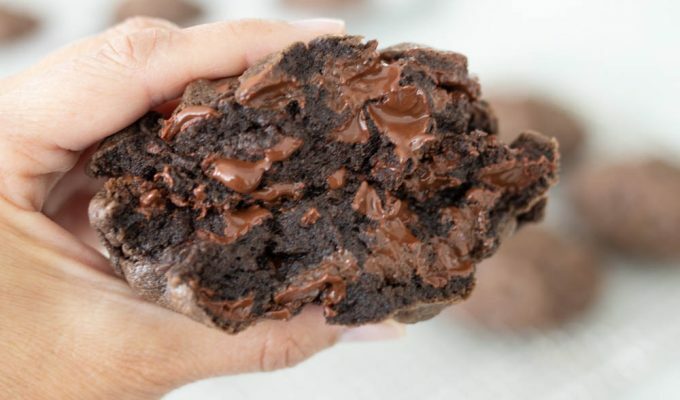 You may, but the Cake flour definitely makes a difference. You can also make your own at home. For every 1 cup of AP flour, remove 2 tablespoons of flour and replace with 2 tablespoons of cornstarch. Sift a few times, 3-5 and then remeasure for use. Up there with one of my favorite waffle recipes. I’ve made it multiple times. One batch feeds a family of three with one or two waffles to put in the toaster the following morning! Crunchy on the outside (like I love), super fluffy on the inside. I can never find cake flour at the store so I make my own following ABK’s directions on how to make it. Quick, so good, and worth it! This is definitely one of our family favorite recipes as well. I love the crunchy outside and fluffy inside, there’s nothing better! Thanks for sharing, Rachel.